40Forward was formed in 2013 to look at the strategic issues facing the wider green movement in the face of climate chaos and mass extinction. Some of the key organisations that make up the green movement – Greenpeace, the Green Party, Friends of the Earth, the Ecologist, etc. – were born in 1972/73, forty years ago. Despite many single issue successes it is notable that the challenges facing our planet are worse now than they were then. The economic system is even less sustainable now than it was then. The challenges facing our planet have multiplied. ‘Politics As Usual’ is failing the planet disastrously. And green politics has not made the impact it needs to have done. It needs re-evaluating. 40Forward has been set up to look at the way green politics works in the UK – inside mainstream parties, through the Green Party, through NGOs, and through direct action, community action and lifestyle groups – to see what ways can be found to make the greens more politically effective. We are doing this by promoting discussion and by developing ways of getting greens to work together, across party barriers and across the divide between those who engage in party politics and those who don’t. We are looking for strategic political opportunities that enable us, as a movement, to shape the direction this country is taking in response to the ecological crisis. 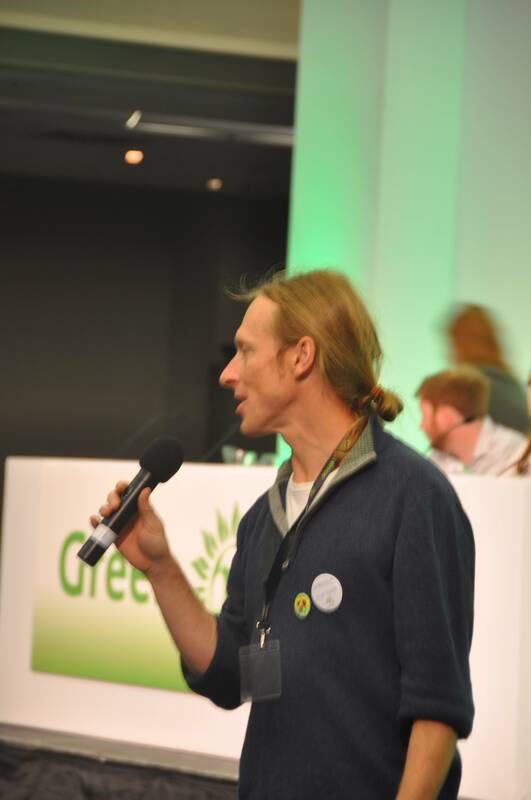 The Green Party –How far have we got? After forty years the Green Party of England and Wales has 141 Principal Authority councillors, one MP, two MEPs and a couple of London Assembly members. For its size it punches well above its weight, but its size is very small, and hence those punches amount to little in the overall scheme of things. Each year the party grows a little more, adding a few extra councillors. Meanwhile the health and well-being of the planet and all its inhabitants continue to deteriorate at an alarming rate. Massively funded vested interests have successfully downgraded the ecological imperative amongst policy makers and the public. A once promising agenda for effective global action against climate change has stalled. The atmospheric level of CO2 has hit 400ppm – the highest in human history (the highest in 3.6 millions years!) with barely a murmur of concern from mainstream politicians. Sad as it is to admit, the Green Party (and the wider green movement) is failing; failing in a battle which, ironically, no-one can afford to lose, because to lose means losing everything. To continue along our present trajectory is clearly not enough. We must turn the tide within the next ten years and achieve what we’ve failed to do in the last forty – and make the 50th anniversary of the Green Party a celebration of real success. Where are we going wrong? What can we do to help mobilise the enormous, but fragmented, green movement into a truly effective force for change? How can we awaken the public, and even our opponents, to the inevitable calamities impending from current practices, and most importantly, convince them that a sustainable green alternative, that offers a decent quality of life for all, is absolutely possible? 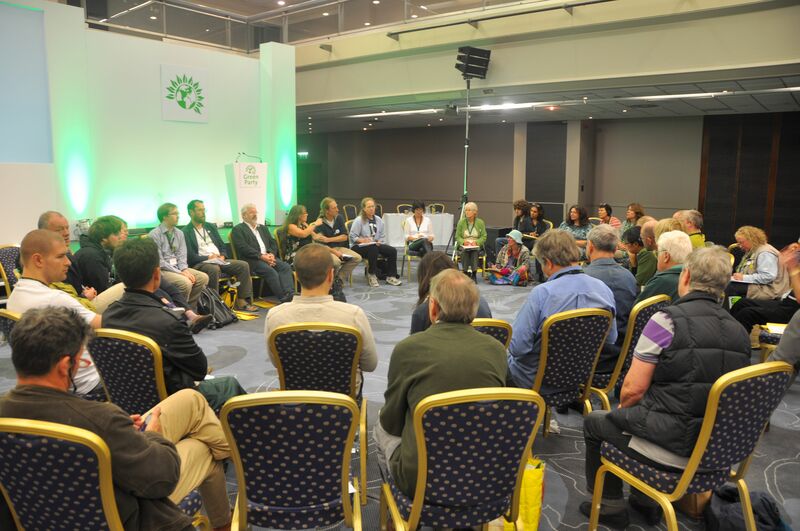 At the Green Party’s 40th anniversary conference a new group, 40 Forward, was set up to seek answers to these questions and to ask what more could be done to increase green political leverage, and what the Green Party could do to facilitate this. We welcome comments, ideas and participation from any interested parties (which should be every person on planet Earth, and visiting aliens!). Interestingly, clues to some of the answers to these questions might be found by looking at the origins of what is now the Green Party – what motivated and inspired the founding members. In the beginning the party referred to itself as a political ‘movement’ rather than a ‘party’, and its identity was shaped by the merging of two organisations. The first of these was PEOPLE, assembled in late 1972 and officially launched in February 1973. Founding members Lesley and Tony Whittaker, Michael Benfield and Freda Sanders, known as the Gang of Four, took their inspiration from a report entitled The Limits to Growth, (1972) commissioned by the Club of Rome (a thinktank of scientists, economists, industry and politicians). This document explored various growth scenarios which mostly ended in economic and societal collapse during the 21st century. (Interestingly a 2008 study into the report by the Commonwealth Scientific and Industrial Research Organisation, incorporating actual data of changes to the world since 1972, came to the same conclusions). The second organisation, the Movement for Survival, was set up by Teddy Goldsmith to campaign on the issues raised in A Blueprint for Survival, a special edition of the Ecologist magazine (Vol.1 No.2 January 1972). Endorsed by top scientists of the time, it sold three quarters of a million copies worldwide. It also pointed out the unsustainable nature of indefinite economic growth and argued for de-industrialisation and decentralisation. Movement merged with PEOPLE in late 1973. During 1973 PEOPLE circulated the magazine Towards Survival, edited by Keith Hudson, to all its members. Its first manifesto, in 1974, was called the Manifesto for Survival.. The survival imperative dominated thinking during those early days, as the movement grappled with the global predictions outlined in ‘Limits’ and ‘Blueprint’. Forty year on, how much more urgent is survival? During that time the world has seen over half its forests destroyed, half its wetlands drained or filled, species vanishing at a rate not seen in 65m years, human population doubled (3.8b to 7b), a vanishing Arctic ice-cap, 45% of agricultural land degraded, seas ravaged by pollution and industrial fishing and rising greenhouse gas emissions – to name a few, and most of these critical problems are not just continuing but accelerating –as we know. It seems incredible that with issues like these, the UK media and politicians obsess over comparatively trivial issues like immigration and EU membership, giving rise to the overtly anti-ecological UKIP! This says a lot about the ability of politics itself, as it stands at present, to respond to the scale of the crisis. And that is where the Green Party can bring some new thinking. Back in the seventies our agenda was centred on ecology. Policies that stemmed from this were redistributive, peace-orientated and decentralist, but that was not the primary concern. Survival was. Some years later Germany’s Die Grunen shifted the focus and proclaimed four basic pillars of green politics: ecology, social justice, nonviolence and democracy. 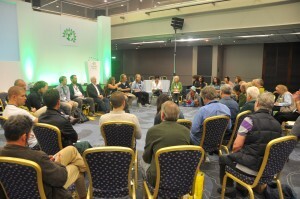 In 1982 the Green Collective in the UK (organisers of the still extant green gatherings and the Greenfield at Glastonbury Festival) went further and identified seven principles: ecology, anti-sexism, nonviolence, liberty (including animal liberation) and direct democracy, justice, co-operation and personal development. These successful attempts to define and broaden green politics provided a wider, more positive appeal, but they had a downside. They softened the focus on survival. Given today’s dramatically worsened situation, should we now re-establish the primacy of survival and allow that to shape our thinking, strategies and organisation? Back in the seventies many were put off the politics of survival by what they saw as alarmism and negativity. The challenge now is to present the survival message in hopeful and positive ways, knowing that despair is not the most motivating of emotions. Many campaigners like to make sure they spend twice as much energy on positive messages, as on negative. PEOPLE’s founders were not looking to create a conventional political party, but they understood that the hegemony of the mainstream parties had to be challenged, and that to gain leverage a new electoral force was needed. The idea was to create a much wider ranging, more inclusive movement, in which participation in the electoral process would be an essential element. Once you lose the conventional ‘party’ identity a whole new range of more flexible, inclusive structures and strategies arise, which is why PEOPLE was not called a ‘party’. The expectations of how a ‘party’ should behave are limiting. PEOPLE sought to become a participative movement that put its emphasis on coalition building and on creating an honest politics. PEOPLE didn’t believe in whips. It didn’t have a single ‘leader’ and terms of office were fixed to discourage careerism. Membership was open to organisations as well as individuals, including members of other parties. The objective was to make change happen. It was considered equally important to get other parties to adopt green policies as it was to get its own members elected. PEOPLE was not positioned on the horizontal left-right spectrum. It introduced a whole new vertical dark green/light green dimension that cut across the old left-right paradigm. It had the potential to appeal to the whole country, enabling people from all backgrounds to engage in a new way of thinking about politics, one which is fundamentally inclusive, because our core issues affect everybody. Two further things illustrate the radical breadth of the founders’ vision. The symbol of the movement was the world with the two waves of Aquarius across its front, to symbolise the dawning of a new age for all humanity. Its colours were coral, white and turquoise; natural colours that represented water, air and earth. The kind of radical thinking evident in the early seventies began to change in 1975 when any ambiguity about whether it was a party or a movement was eliminated. PEOPLE changed its name to The Ecology Party. The choice of the word ‘ecology’ was, with hindsight, not so very astute. At that time ecology was a relatively obscure subject – the scientific study of relationships that living organisms have with their biotic environment. People found it an odd name for a political party. For many who thought they got it, ‘ecology’ was synonymous with ‘environment’. They didn’t fully understand that when applied to politics it is an approach based on systems and holism, where all policies have to be rooted, primarily, in the understanding that human beings are one part of an inter-related and interdependent web of life. In contrast the word ‘environment’, meaning our human surroundings – whether built, natural or social – is inherently anthropocentric, concerned with what appears best for our own species. ‘Ecology’ was the positive counterpoint to ‘survival’, and a unifying philosophy for those who accepted the primacy of ‘survival’, but found it too negative a message. Lesley Whittaker says PEOPLE spent roughly half its time attempting to build relationships with the wider movement, as a necessary first step towards the political mobilisation of that movement. Their first journal, edited by Michael Benfield, was called ‘Alliance’ and listed some 46 national organisations PEOPLE were developing links with. The objective was to get members of appropriate organisations to recognise their common interests and causes, and to support PEOPLE as the electoral arm of the wider movement. In 1973 PEOPLE attempted to host a large coalition building ‘Jigsaw’ conference in Coventry, which aimed to pull together the wider movement and build a more politically coherent whole. Sadly it was cancelled, but the idea was valid, as demonstrated later by Green Party members in two examples detailed below. As the party’s founders stepped back from their national roles, the main coalition-building agenda was dropped. The dominant view of the new leadership in 1978/9 was that a strong Ecology Party, with good organisation and policies, would provide a ‘vanguard’ for the wider movement who would then follow the party’s lead. Pro-active coalition building was deemed unnecessary. The party still operates in the same way today, pursuing few coalition building initiatives, and then being disappointed when many greens support other parties or abstain from the process altogether. However, there are two examples of successful broad based coalition building, initiated by party members, which occurred in the eighties and nineties: the Green Collective and the Real World Coalition. 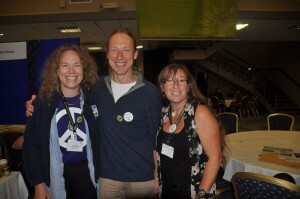 The Green Collective, which began life in 1980 as the Ecology Party Summer Gathering, organised green gatherings – festival-style camps attracting up to 20,000 people. They hosted numerous groups from the ecology, anti-sexist, peace, anarchist, animal rights, social justice and alternative technology movements who ran stalls, events and workshops. Their motto ‘The Greens Are Gathering’ was used to signal the coming together of a broader, more politicised grassroots movement which in 1982 published the Green Declaration spelling out the philosophical and political links that underpinned that coming together. In 1993/4 the Real World Coalition was also started by Green Party members. It brought together the chief executives and officers of prominent national campaigning organisations and charities, such as Oxfam and Friends of the Earth, to agree a common manifesto for change. After three years of negotiation they published ‘The Politics of the Real World’ in time for the 1997 general election. It was remarkably similar to a Green Party manifesto and was endorsed by over 30 of the UK’s leading ecology, social justice and development NGOs –an impressive achievement. In both cases no way was found of taking the initiative further and translating it into real political leverage, but they showed what is possible in terms of wider movement coalition building. Although coalition building has been lacking on the Green agenda as whole, there have been, and are, many initiatives around single issues and agendas. The party has joined many campaigns started by pressure groups. Caroline Lucas recently played a prominent role in the launch of The People’s Assembly Against Austerity. We have successfully co-authored parliamentary bills with NGOs, and party members are active in various red-green initiatives, such as Compass. Could the Green Party of today, with its elected members at various levels, growing membership and long distinguished track record, have the credibility and ability to pull off a grand coalition building initiative similar to PEOPLE’s attempt of 1973? Many would argue that there’s a contradiction, or at least a dynamic tension, between the inclusive vision of the Green Party’s founders and a party political system. Parties and factions (parties within parties) are by their very nature divisive. They create a political culture and discourse that generate conflict. Despite wanting to engage people, ‘parties’ more often put them off. It’s important that we remember that there is a more ‘green’, co-operative and inclusive way of doing politics. Petra Kelly had a good phrase for the inherent contradiction between the words ‘green’ and ‘party’. She called Die Grunen ‘the anti-party party’..
Reasoned debate is healthy, but institutionalised division creates opposition for opposition’s sake and limits opportunities for co-operation and conflict resolution. This is reflected in the design of the House of Commons’ debating chamber and in political commentary in the media, which thrives on and encourages conflict. All this alienates people from the political process. Overly constitutionalised parties ossify and become resistant to change. Organisational complexity can discourage and reduce democratic participation. Pressure to follow a party line suppresses free speech and creates an impression of lying. People invariably know when a politician is speaking a line rather than their truth. Is there another way of conducting politics? One which slices through the barriers of party lines and creates spaces for people to find common ground; to build agreements for effective action to address the urgent challenges facing us all, whilst maintaining elected accountability? In creating a non-conventional and inclusive approach to politics the Green Party’s founders had this in mind. The big question today is ‘what can we do to create an inclusive vehicle that has the ability to seriously challenge the mainstream agenda and focus minds on the imperative of survival?’ After all, when it comes to survival, that terribly misused and hackneyed slogan “We’re all in this together” is for once entirely appropriate.